Da Capo Lifelong Books, 9780738209500, 240pp. "Am I black or white or am I American?" "Why don't my eyes look like yours?" "Why do people always call attention to my 'different' hair?" Helping a child understand his mixed racial background can be daunting, especially when, whether out of honest appreciation or mean-spiritedness, peers and strangers alike perceive their features to be "other." Drawing on psychological research and input from over fifty multiracial families, Does Anybody Else Look Like Me? 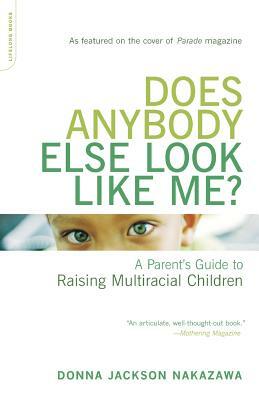 addresses the special questions and concerns facing these families, explaining how we can best prepare multiracial children of all ages to make their way confidently in our color-conscious world. From the books and toys to use in play with young children, to advice on guiding older children toward an unflappable sense of self, Does Anybody Else Look Like Me? is the first book to outline for parents how, exactly, to deflect the objectifying attention multiracial children receive. Full of powerful stories and counsel, it is sure to become the book adoptive and birth parents of different races alike will look to for understanding as they strive to raise their children in a changing world. Donna Jackson Nakazawa has been a regular contributor to AARP's My Generation, as well as to Working Mother, Modern Maturity, New Woman, and Baby Talk. She is married to a Japanese-American and has two children. She lives in Annapolis, Maryland.